– Paddlers must keep within the natural banks in the main stream up to Kliphoek. All competitors are only allowed to portage at Kliphoek farm/Oordraplek. – Paddlers will be directed by signage on the banks and will have to paddle past Bokkomlaan on the home straight into Velddrif. Slow paddlers start at 7:30 and the leaders group at 8:00 followed by a mass start at 8:30. Turn left out of Zoutkloof. Drive back to Kersefontein, turn left across the river and at the T-junction turn left. You will see the river on your left to watch the paddlers. This is a popular spectator spot. You might have to park some way down the road. Accessible to 4×4 vehicles only via the right-hand bank of the river. Follow the road to Velddrif and turn right at Kliphoek farm. This is a compulsory portage and a good time to give your paddler that last energy boost about 10km to the finish. Toilet facilities are available. 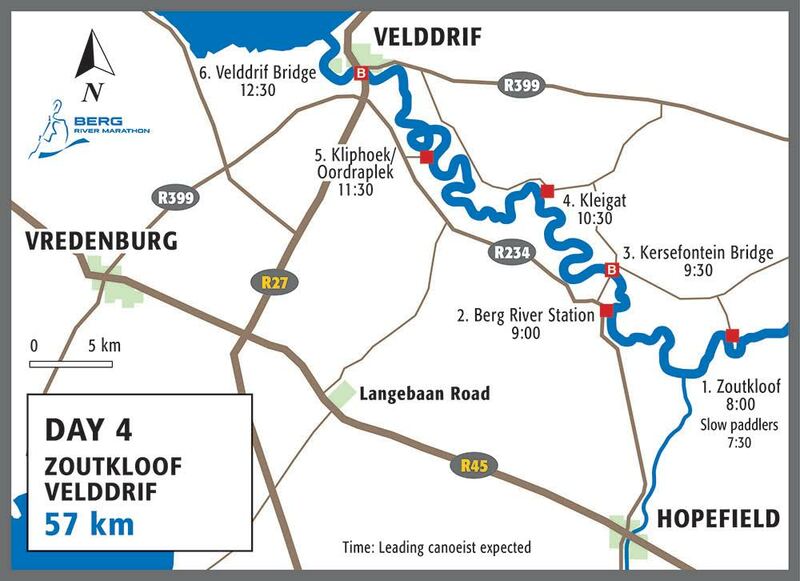 Follow the road signs to Velddrif where the race finishes at Carinus Bridge next to the Riviera Hotel. Preferably park on the opposite side of the road from the hotel next to the river. The prize-giving function will be at the hotel as well.